← People Let Me Tell Ya ‘Bout My Beeeesssst Friend…. Left to right, that’s Showman, RyDazzle, and me. 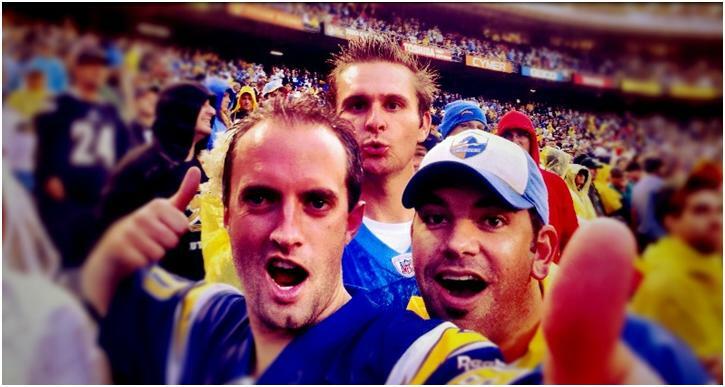 We went to the Chargers vs. Packers game on Sunday, Gravy took the photo and posted it here. It was an amazing game to attend. High scoring. High drama. High talent. A very difficult game to lose. Aaron Rodgers played out of his mind, as usual… and Philip Rivers, sadly, threw 3 critical interceptions that ended up costing the Bolts the game. The stadium was packed with Packers fans. (no pun intended) It was dis-heartening to see Clay Matthews on defense, raising up his arms to the crowd, and the crowd listened… making it much louder for Rivers and the offense. We quickly understood why the Chargers were pumping in sound at practice all week…for a home game. When Kuhn touched the ball… the place erupted with chants of “KUUUUUUUUUUUUUUUUUUUHN!” It felt like Petco when the Cubs or Red Sox are in town playing the Pads… in the same way, the Chargers’ fans were overwhelmed. A very bizarre feeling. Tough game to lose, but man, we saw some glimpses of brilliance from our team, so there is still hope. A lot of fans are throwing in the towel, but I’m not one of them. We still control our own destiny in an awful AFC West. Whoever wins Thursday against the Raiders will probably take the division. Think about it this way… if I told you, a Chargers fan, that we’d be without our best defensive player, Shaun Phillips, our no. 2 WR, Malcolm Floyd, and to date, our top offensive performer, starting RB Ryan Mathews… and we’d still be in the game with less than a minute left in the 4th quarter, you’d take it. I’m not playing the moral victory card or any of that crap, I know we lost, and it sucked, but we looked better in this game than we did in some of our wins. Tons of holes that need to be filled, but wasn’t it right around this time last year that the Packers went from being a mediocre team to Super Bowl champs? One last thing, I gotta give a shoutout to our buddy SLOAN!!!!!!! Man, without you, and your good friend, our day would not have been as fun. This entry was posted in Football, NFL and tagged aaron rodgers, Chargers, Chargers vs. Packers, Packers, Philip Rivers. Bookmark the permalink.